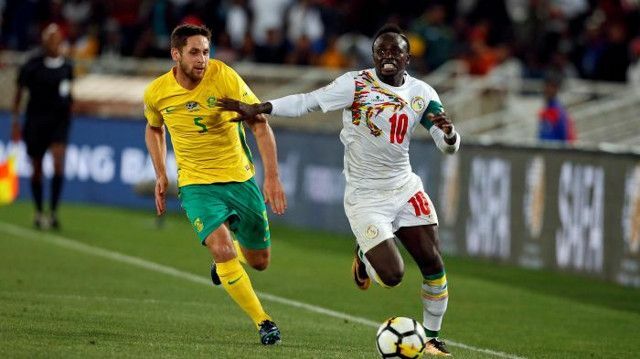 Sadio Mane booked his place at Russia 2018 on Friday as Senegal beat South Africa 2-0 at the Peter Mokaba Stadium. The Liverpool winger’s nation secured a place at the World Cup finals for the first time in 16 years, with their last appearance coming in 2002. Mane was inevitably at the forefront of the action, justifying his team’s eagerness to give him the ball at every opportunity. He needed no more than 12 minutes to make the difference as his incisive through ball fed the run of West Ham’s Diafra Sakho, who slotted home to make it 1-0. Senegal doubled their lead in the 35th minute, when Mane’s saved shot rebounded in off South Africa’s Thamsanqa Mkhize for an unfortunate own-goal. Mane proved to be a menace throughout and maintained the explosive form he displayed in Liverpool’s 4-1 win over West Ham last weekend. Mane’s inclusion in Senegal’s squad last month had come as something of a surprise after he had been ruled out for six weeks through injury. Liverpool fans were as equally shocked to see him start in the recent win at the London Stadium, where he played a starring role alongside Mohamed Salah. With Senegal having secured qualification, Jurgen Klopp will be keen to see Mane rested for Tuesday’s return match against South Africa out of caution for his early return to fitness. An intriguing clash with Mane’s former club Southampton awaits after the international break, with Liverpool looking to put the pressure on fourth-placed Chelsea.